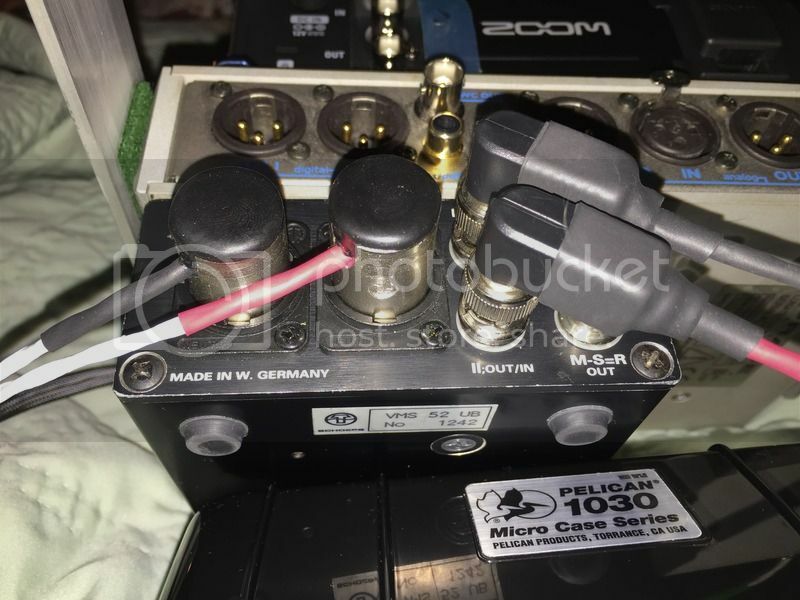 does anyone know where i can get BNC connectors like the ones in this picture, I'm making up cables for VMS. I think rob, dark train made these. I think I want some BNC>XLR cables exactly like this for my VMS>70d setup! I'm going to get Robb aka DarkTrain to make me some straight BNC>Right-Angle Stubby XLR's for my VMS>70d setup, so thanks for the ideas everyone I already have Gold Radio Shack BNC>RCA adapters, and then Straight & Rt-Angle RCA>Rt-Angle Stubby XLR's, but Id prefer the locking connectors of the BNC>XLR, so both ends are locked into place! The F8 is line in on 1/4", mic in on xlr. Yea im sure. Steve is the only one running it like that i think. I'm going to look through the manual real quick, but I believe you Dustin Just odd that Zoom would do that? EDIT: Yea, just saw the manual. I knew you were right Dustin, however, I wanted to see if they explained why? Doesn't seem to mention why after looking through! All I can say is that's strange that the line inputs are supposed to be on 1/4" inputs only Wonder what is wrong with using the XLR's? 1/4" just have a higher input? Probably easier to clip the XLR inputs since their meant for a mic signal and not a line signal! I was skeptical about using 1/4" inputs. I like to run different outboard pres. But the chopped right angle 1/4" cables Ted made me cured that. Rock solid in my bag! I wouldn't have a problem running the 1/4" plugs either. It is what it is! Just wondered if they mentioned why? But the line in is probably close to 50db hotter than the mic IN, at least that's how Sonosax setup their MIC/LINE inputs! Something like a 50db hotter/lower signal! If you have a SUPER hot preamp, it might brickwall the F8 XLR inputs? But the VMS is the hottest preamp Ive run, so if Steve is running VMS/PSP3/etc>XLR>F8, the XLR input can handle a pretty hot signal and you should have a hard time clipping it like that, if its even possible? Thanks for the heads up though, Dustin! I had never known that about the F8 until reading your post this morning! Sound Devices USBpre2 is the same. BNC connectors are highly shielded, bayonet connectors with constant 50 or 75 ohm impedance for high frequency RF use. We used to call them "British Naval Connectors", but that is not actually true, the design name is actually "Bayonet Neill–Concelman". So, radio shops have them. Commercial, Ham, etc. The security industry took a liking to them for video, and CCTV vendors also have them. Old computer dudes will remember them as early Ethernet Base2 connectors. They are very easy to find new or surplus, and the Mil-Spec surplus variety are excellent. Keep to 75 or 50 ohm and don't mix them, although they can be mated, you'll get the best fit with the match. Be sure the cable-end diameter makes sense, as that is the biggest variation in design. Amphenol and Neutrick are my go-to brands. I need a pair of nice BNC>Right Angle Stubby XLR's for my VMS>70d! Right now I have Gold Rat Shack BNC>RCA adapters, with Rat Shack RCA Splitters, RCA>XLR's>70d and the other output from my splitter went to my VMS>M10 backup setup, which I dont have now! So I want to slim down the cabling on the back of my VMS and get some Darktrain Straight BNC>Rt Angle Stubby XLR's, and I would be set!